High Court may yet overturn Elections Committee ban on MK who took part in the Marmara flotilla. 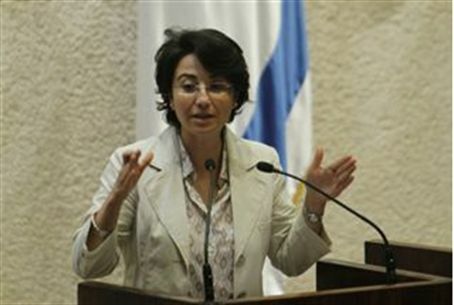 The Elections Committee decided Wednesday to ban MK Hanin Zoabi (Balad) from running for the 19th Knesset. The decision was supported by 19 members, with nine opposed and one abstaining. Zoabi is appealing the decision before the High Court, which may very well decide to overturn the ban. The Court overturned a similar ban against the Balad party and the Raam-Taal party in 2009, after the Elections Committee voted to prevent them from running for Knesset. The members of the committee who voted in favor of banning Zoabi included the representatives from the Bayit Yehudi (Jewish Home), the Ichud Leumi (National Union), Shas and United Torah Judaism (UTJ). The committee rejected requests to disqualify the entire Balad party, however. While 13 members supported the disqualification, 16 were opposed to it and one abstained. Among the supporters were the Bayit Yehudi and Ichud Leumi. Shas and UTJ opposed the ban, however. The proposal to disqualify Raam-Taal, which is led by MK Ahmed Tibi, was also voted down, with seven supporters and 17 opponents. Balad and Raam Taal may join Zoabi's appeal before the High Court to prevent her disqualification. MK Ofir Akunis (Likud), who initiated the move to disqualify Zoabi, said after the decision that "MK Zoabi blatantly transgressed the Basic Law: Knesset when she took part in the terror attack aboard the Marmara, and she therefore has no place in the Knesset. Israel's democracy must know how to defend itself from those who seek to destroy it from within. I hope and believe that the disqualification will be upheld by the High Court."